Many evenings during the week in May and June, at precisely 9pm (OK, maybe not precisely…sometimes at 9:04pm), guests of the Inn on Mill Creek B&B and North Carolina Birding Trail site are treated to short symphony by the Eastern Whip-poor-wills. Since it is a May mainstay in our neck of the woods, we’re bestowing the Whip-poor-will with the honor of being our May 2014 bird in our 12 Months of Birding at the Inn series on the blog. The Whip-poor-will’s song sounds like, well, “whip-poor-will”, and most evenings in late spring and early summer, the Whip-poor-wills will sing as they make their way from Bernard Ridge on the eastern side of the property to the Inn’s apple orchard and Horse Ridge on the western side of the property, on the hunt for insects. Since they’re night owls — er, night birds — they are not often easy to spot. However, once they start having babies, the young Whip-poor-wills sometimes perch on the deck railings at the Inn as they explore their neighborhood. If you do happen to see an Eastern Whip-poor-will, you’ll notice that it has a brindle pattern of grays and browns. This is excellent camouflage, allowing the Whip-poor-will to blend in with tree bark and leaves during the day as it likes to roost on the ground. 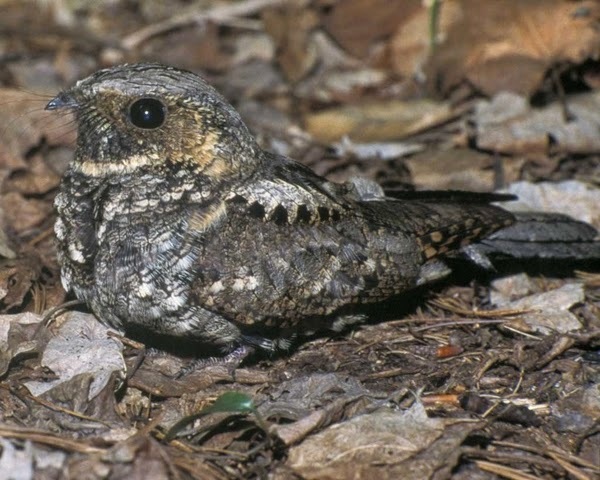 The Eastern Whip-poor-will is not a common bird in the western North Carolina mountains, and as forest habitats become suburbs, they’re becoming even more uncommon. So we feel special that they have decided to make Pisgah National Forest and our particular neck of the woods their summer abode. In fall, they head south toward Mexico and Central America, and we don’t hear them again until May. What an exciting night it is each year when we hear the first Eastern Whip-poor-will tuning its instrument! This entry was posted in Uncategorized and tagged 12 Months of Birding at the Inn, birding, Spring, Summer by Inn on Mill Creek. Bookmark the permalink.